A good hearty main dish for either breakfast, lunch, or dinner, this recipe is an interesting combination of ingredients and flavors. Sweet potatoes and onions are sauteed with corn and garlic for the veggies; soy ground beef and eggs are added for the heartiness. Use salt and pepper generously to season while you cook, as the dish is otherwise slightly bland. 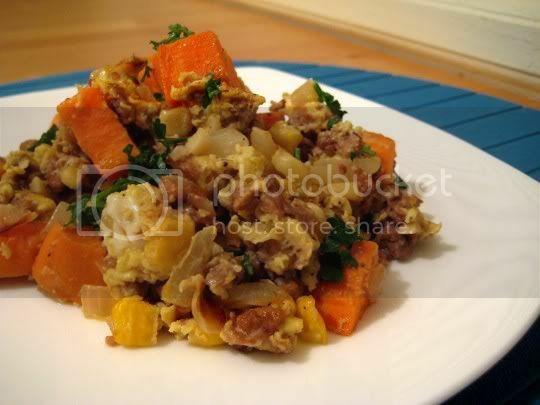 Still, the sweet potatoes add an interesting flavor to a standard savory hash. The onions and garlic further the savoriness. But for EXTRA flavor, add a condiment: ketchup, barbecue sauce, hot sauce, some sprinkled cheese...something. I went with ketchup and hot sauce, and that "something missing" was finally found. The ketchup had enough tanginess in it to not battle with the sweet potatoes, and the hot sauce added that spicy vinegar flavor that we all love. The final sprinkling of parsley for serving is unnecessary...but note, the sweet potatoes do need to be cooked for longer than the suggested 10 minutes. I would probably steam them for a few minutes before the sauteeing, or at least saute them for an additional 5 or so minutes before adding the onions. They were just a little too hard for what they should have been. Make again? Yes. Surprisingly, leftovers weren't bad either...but I probably wouldn't refrigerate these for more than a couple days.